If you or someone in your life loves everything girly....you are going to love our FQB "Girly Girl" Collection! 1 Banner - "Always look on the Pink side of life!" 1 Cluster made up of the makeup bag, shoe, lipstick and flowers...possibly the exact starting point for your scrapbook layout, card or mini album! 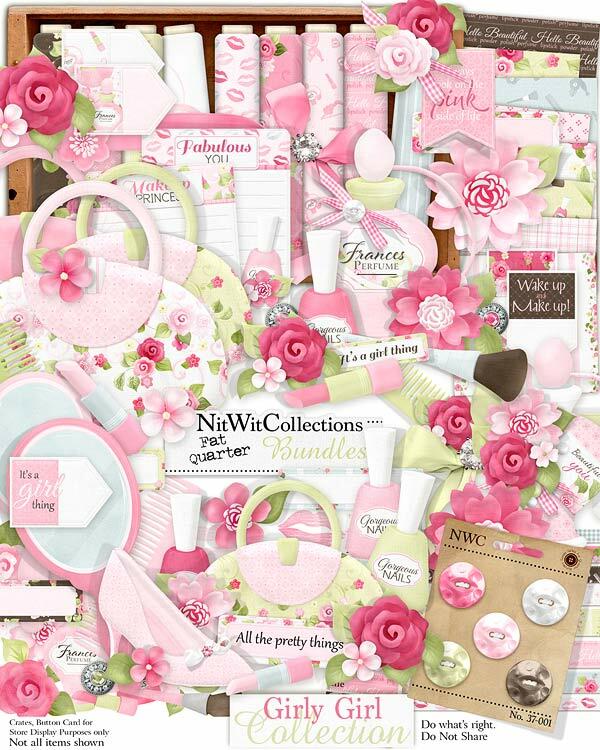 1 Journal label - "Makeup Princess" with a muted image of makeup accessories and the perfect journaling element for your mini albums, cards, and scrapbook layouts. Preserve that memorable time! 3 Lipstick kisses...who can resist using these!! 1 Makeup corner to add in this marvelous element cluster where you see fit. Is it the corner of a photo or somewhere else...you decide! 4 Nail polishes in 4 different shades. What do you think looks best with your creation?? 3 Ribbon bows with a diamond-like centre...let them shine! 1 Tab - "It's a Girl Thing"
1 Tab - "Wake up and Make up"
1 Tab with the bold floral appeal gracing the top of it. Use these tabs to point to something in your creation, a bookmark type use in mini albums, to journal on, and so much more!